In 1956, the Federal Republic of Germany approved the Indemnification Law for the victims of the Nazi regime. Designed to compensate survivors of the Holocaust, it opened the door to other groups persecuted by Hitler. These included republicans exiled from Spain after the Civil War. In the years that followed, around 20,000 Spaniards filed claims for compensation. Yet more than half had never been deported to concentration camps or even set foot in Germany. Who were these people? During the Second World War, 50,000 Spanish exiles were forced to help build the Atlantic Wall, a giant system of fortifications designed to prevent the Allied invasion. In France alone, 300,000 people worked on the construction.More than half were French, Belgian, Dutch and German workers who signed up voluntarily, attracted by the high wages. However, the victims of forced labour included Soviet prisoners of war, Jews and Spanish republicans. 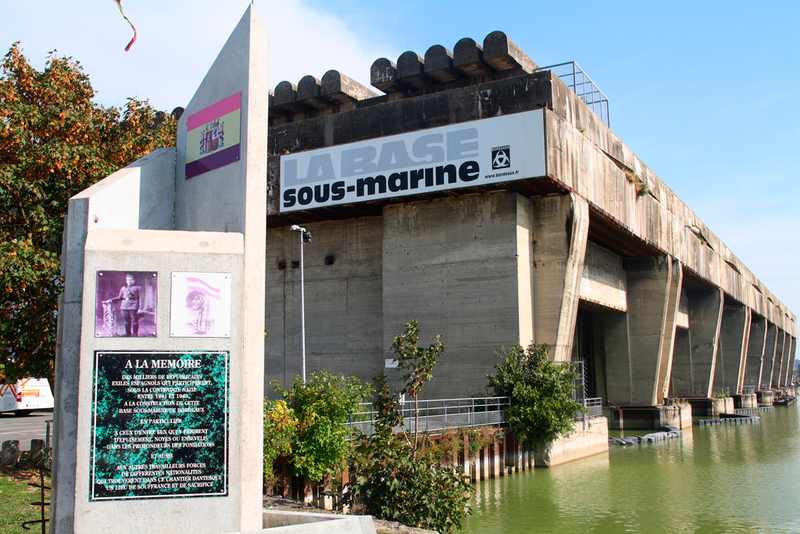 In the ports of Brest, Lorient, Saint Nazaire, La Rochelle and Bordeaux, the work of Spanish exiles was instrumental in building massive concrete structures to protect German submarines, structures that still stand to this day. 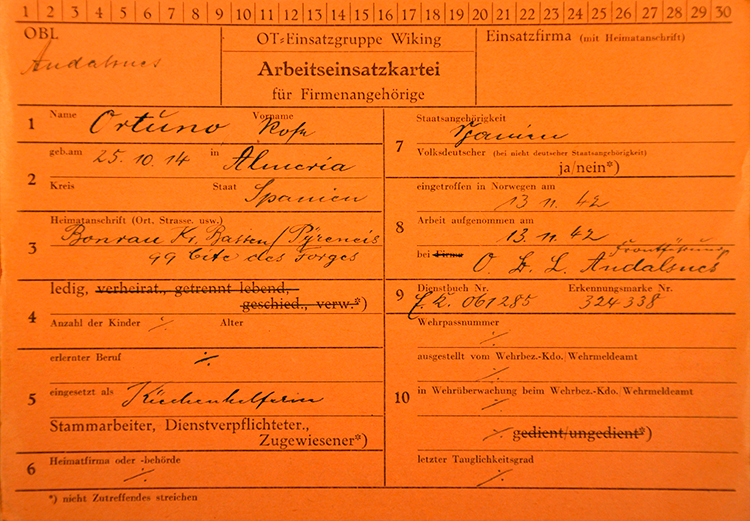 Document of Rosa Ortuño, Spaniard forced labour in Norway. Source: National Archives of Norway. The Federal Republic of Germany indemnification service dismissed the demands of the Spaniards who worked on the Atlantic Wall. In an argument that echoed Nazi propaganda, the service claimed their participation had been voluntary. Advised by lawyers, the exiles took their case to the German courts. They argued that they had been held captive in camps guarded by the SS and forced to work exhausting days, often without pay. The court in Cologne investigated the living and working conditions of the Spaniards involved in building the Atlantic Wall. The process involved gathering documents, commissioning studies from historians and calling hundreds of witnesses. Members of the SS and the Gestapo, soldiers, technicians, engineers, construction businesses and even prominent Nazis like Albert Speer all testified in front of the judges. Thousands of Spanish exiles also gave evidence. They provided accounts of their lives in the labour camps on the Atlantic Coast and medical reports certifying the physical damage caused by the hardships they had suffered. Memorial to the Spaniard Republicans who worked in the marine base of Bordeaux, in the background. After a long inquiry, at the end of the 1960s, the judges ruled that the Nazis viewed the Spanish republicans as potentially dangerous ideological enemies. For this reason, the authorities in occupied France treated them particularly harshly. Just like Jews and Soviet prisoners of war. The sentence set a precedent for hundreds of cases. The judge ruled that in some of the French camps the living and working conditions faced by Spanish republicans were just as inhumane as in the German concentration camps. Practically treated as slaves by the Nazi regime, German democracy officially recognised the Spanish exiles as politically motivated victims of the Third Reich. They became the first victims of forced labour under the Nazi regime to receive compensation from the Federal Republic of Germany. It took more than 20 years and the fall of the Berlin wall before the vast majority of the victims of forced labour under Hitler’s regime—largely from Eastern Europe—received compensation. 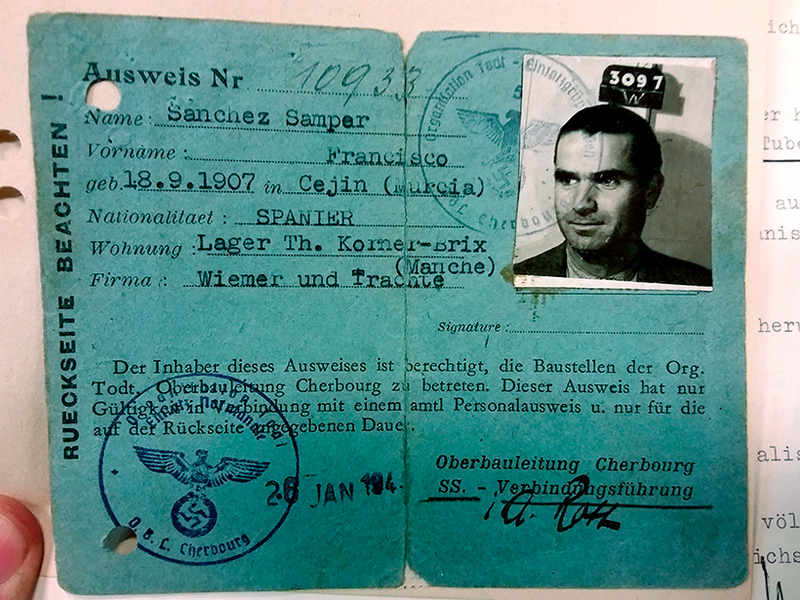 Document of Antonio Samper, Spaniard who worked in a labour camp in France. Source: Indemnification Service for Nazism Victims in Düsseldorf. Antonio Muñoz Sánchez is a historian and postdoctoral researcher at the Institute of Social Sciences of the University of Lisbon. He is an expert on the campaign fought in the 1960s by Spaniards deported to Nazi concentration camps for recognition as victims of the Nazi regime by the Federal Republic of Germany. He is currently researching and preparing an exhibition on the use of Spaniards for forced labour in Nazi Germany.